Global travel & tourism companies are focusing on emerging economies such as BRICS countries. The travel & tourism industry is growing in China. Outbound tourism in China is expected to be a good opportunity for global travel & tourism market players. According to China Outbound Tourism Research Institute (COTRI), the number of outbound trips by travelers from mainland China in 2018 was 162 million and is forecast to reach 180 million by the end of 2019, expanding at a CAGR of 16.4% from 2000 till 2019. This represents a huge opportunity for travel & tourism market players operating in China and companies are focused on attracting Chinese outbound travelers to provide travel & tourism services. The top destinations for Chinese travelers are Thailand, Japan, Singapore, Vietnam, Indonesia, Malaysia, Philippines, South Korea, North America, and South America, etc. The European Union (EU), Turkey, and Canada have formed a partnership to attract more Chinese visitors. To increase the number of Chinese visitors, the governments of Canada and China named the year 2018 as the Canada-China Year of Tourism. In 2016, more than 610,000 Chinese tourists visited Canada and the government of Canada has set a goal of doubling the number of Chinese tourists coming to Canada by 2021. Similarly, Turkey is also increasing its travel partnership with China. EU has formed a tourism partnership named 2018 EU-China Tourism Year. According to the European Travel Commission (ETC), the number of Chinese travelers visiting Europe increased Y-O-Y by 5.1% in calendar year 2018 compared to calendar year 2017. The top destinations for Chinese visitors in the EU are the U.K., France, and Germany. All these factors are expected to create a good opportunity for travel & tourism market players in EU, Canada, and Turkey to tap the growing Chinese outbound visitors. Across the world, there is an increasing interest among travelers to visit unique places and experience new things. It is observed that travelers across the globe are spending more on experiences compared to materialistic things such as hotel facilities, food, etc. Millennial travelers especially want unique experiences that are a once-in-a-lifetime experience. In this environment, ecological tours are becoming increasingly popular. As per Travel Trend Report 2019, ecological tours are the most popular and demanding tours among travelers. It is also observed that global travelers are more interested in experiencing local culture and food habits when visiting a location. Globally, travelers are seeking more adventure related experiences than before. To rejuvenate oneself from hectic daily work life, travelers prefer a multi-day tour than a single-day tour for leisure activities. Multi-day tour is the most preferred option among travelers and these tour bookings are done more in advance compared to single-day tour bookings. With rise in internet penetration, it is observed that travelers are getting more options for booking travel tickets. As per Travel Trend Report 2019, from 2017 to 2018, the number of direct online bookings decreased from 79.2% to 66.7% but marketplace booking increased from 3.2% in 2017 to 9.1% in 2018 and booking made through agents increased from 17.5% to 24.3%. Travel agents booking tickets online for travelers are known as OTA (Online Travel Agents). OTAs are using multiple channels such as online marketplaces, resellers, booking agents, hotels, etc. to manage high volume of ticket bookings. The global travel & tourism market consists of global players as well as large number of medium and small players. The report includes detailed analysis of the global travel & tourism market, SWOT (Strength, Weakness, Opportunity, and Threats) analysis of the market, Porter’s Five Force analysis, key macroeconomic indicators influencing the market, travel & tourism market regulations, value chain analysis in various geographies, and travel & tourism trends across the globe. The report highlights major companies operating in the global travel & tourism market including TUI Group, Hilton Worldwide Holdings Inc., Carnival Corporation & plc, Airbnb Inc., Crown Resorts Ltd., Accor plc, Balkan Holidays Ltd., G Adventures, Adris Grupa d.d. and OYO Rooms. This report on the global travel & tourism market provides analysis for the period 2017–2027, wherein 2018 is the base year and 2019- 2027 is the forecast period. Data for 2017 has been included as historical information. The report covers market dynamics including drivers, restraints, opportunities, and trends that are expected to influence the expansion of the global travel & tourism market during the said period. The study provides a comprehensive analysis on market growth throughout the above forecast period in terms of value estimates (US$ Bn) across different geographies. The global travel & tourism industry is growing. As per World Travel and Tourism Council (WTTC), the global travel & tourism industry has grown from US$ 6.03 Trillion in 2006 and reached US$ 8.27 trillion by 2017 growing at a CAGR of 2.9%. Across the globe, rise in middle class population, rise in travels by millennial population compared to other generations, increased awareness among youth about travel destinations with growth in social networks, and decrease in cost of air travel are increasing the number of people travelling across the globe. Rise in number of international travel departures across the world and leisure travel is driving the global travel & tourism market. As per World Bank, the number of international travel departures increased from 633.4 million in 1995 to 1.57 billion in 2017 increasing at a CAGR of 4.2% from 1995 till 2017. In 2016, globally as per WTTC, about 76.8% of travel revenue was generated from leisure travel and 23.2% of the revenue was generated from business travel. Rise in the number of leisure travelers across the world is increasing the market size of the travel and tourism industry. Thus, rise in number of international travel departures, rise in leisure travel, and rise in disposable income and travel promotions by international bodies such as United Nations World Tourism Organization (UNWTO) is increasing the market size of the travel and tourism industry. The study provides a conclusive view of the global travel & tourism market by segmenting it in terms of travel days, travel type, and application. In terms of travel days, the global travel & tourism market has been classified into within 7 days, 7-15 days, and more than 15 days. In terms of travel type, the market has been segmented into leisure spending and business spending. In terms of application, the market is segmented into domestic spending and international spending. The analysis of the above segments is based on present and forecasted global demand for travel & tourism products and the prevailing and future trends in the market. We have analyzed the present and estimated regional market size of travel & tourism products across North America, Europe, Asia Pacific, Middle East & Africa (MEA), and South America. The regional travel & tourism markets are further broken down into country level markets in the following geographies: the U.S., Canada, Germany, U.K., France,China, Japan, India, GCC, South Africa, and Brazil. The global travel & tourism market consists of global players as well as large number of medium and small players. The report includes detailed analysis of the global travel & tourism market, SWOT (Strength, Weakness, Opportunity, and Threats) analysis of the market, Porter’s Five Force analysis, key macroeconomic indicators influencing the market, travel & tourism market regulations in various geographies, and trends. The industry analysis includes value chain analysis of the global travel & tourism market. The report highlights major companies operating in the global travel & tourism market includingTUI Group, Hilton Worldwide Holdings Inc., Carnival Corporation & plc, A‌i‌r‌b‌n‌b‌, ‌I‌n‌c., Crown Resorts Ltd., Accor plc, Balkan Holidays Ltd‌‌., G Adventures, Adris Grupa d.d., and OYO Rooms. 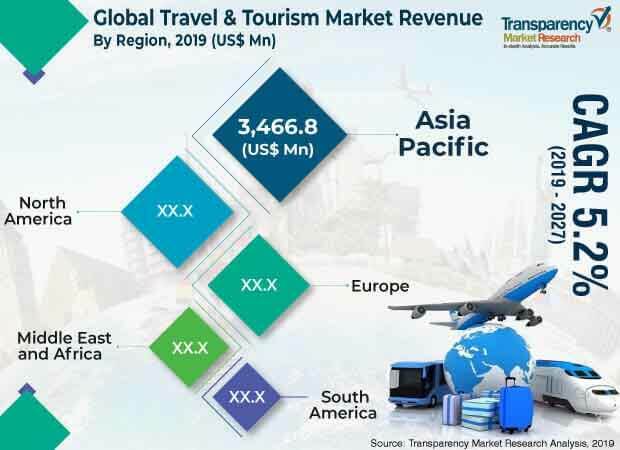 These market players have been profiled in terms of attributes such as description of the company, financials (if available), products, and key strategies to increase market share in the global travel & tourismmarket.